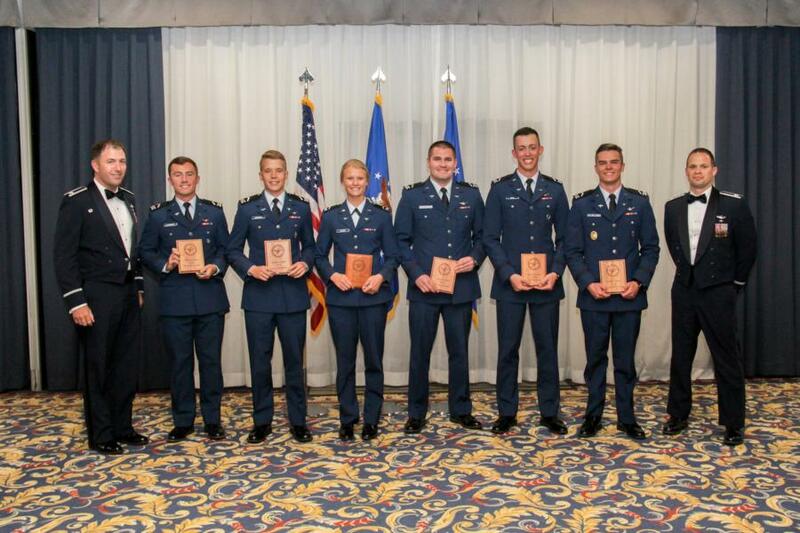 Earlier this week the Cadets and Staff of the 94th Flying Training Squadron got together to celebrate the completion of another academic year with the 2018 G-Wings and Annual Awards Ceremony. The invocation was provided by the National Chaplain of the National WWII Glider Pilots Association, Mrs. E Susan Pinter. 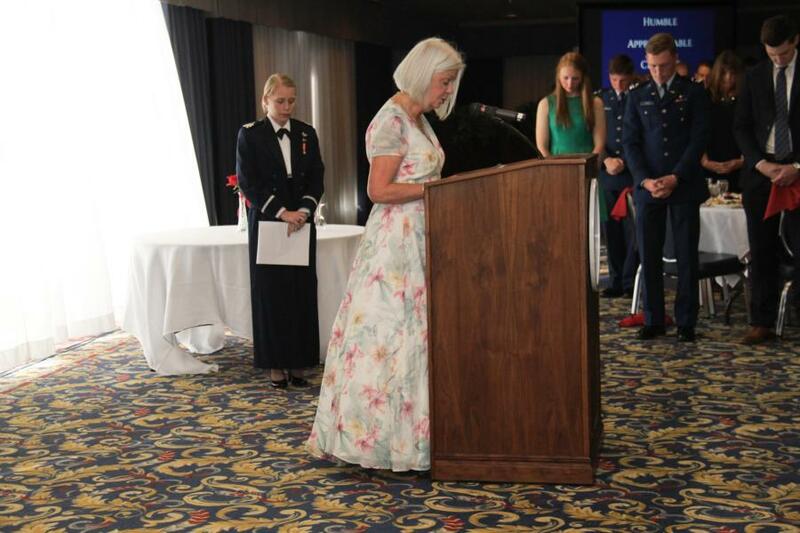 Guests of the evening included the 94th FTS Honorary Squadron Commander Mr. William Nelson. The WWII Glider Pilots Association representatives Ms. Patricia Overman, the National Wing Commander and Ms. Susan Pinter the National Chaplain. 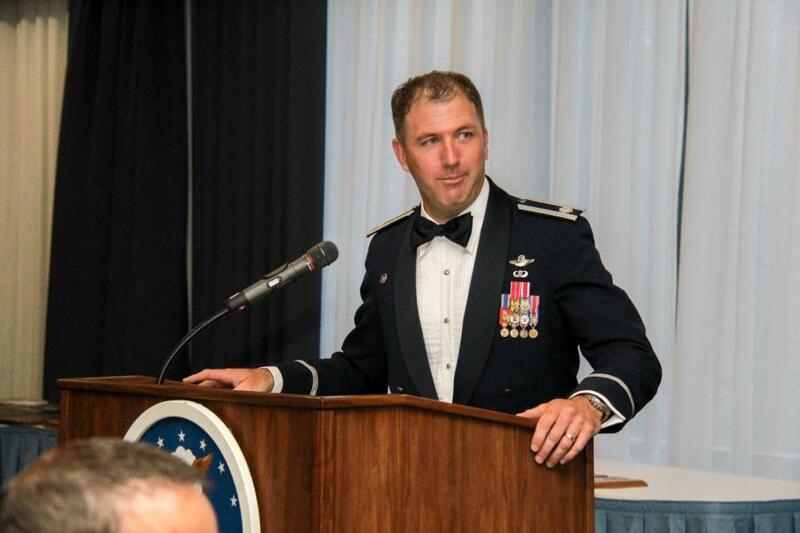 The evenings guest speaker, Commander, 61st Fighter Squadron Lt Col Rhett “Hero” Hierlmeier. And finally the family and friends of Cadets and Staff. After dinner, it was time for the guest speaker Lt Col Rhett Hierlmeier. He talked about his career, and paying it forward and how to be the change. On paying it forward he told the Cadets to, "share your experiences and stories, be a coach and a mentor, make the next class even better than you, and leave a mark, make a difference." Following, being the change he said, "We need an AF culture/climate that drives innovation/disruption." Suggesting how Cadets can be agents for positive change by experiencing vulnerability, building and celebrating diverse teams, be able to see different perspectives, challenge the status quo, fight thru the frozen middle, and to be the first to adapt, and quickest OODA loop (observe, orientate, decide, act). Quoting B.H. Liddell Hart he said, "The Downfall of civilized states tendcs to come not from the direct assaults of foes, but from internal decay combined with the consequences of exhaustion in war." After the guest speaker it was time for the Awards to begin. The first award of the evening was the Larry McNeel Award, established in memory of Cadet First-Class Larry “Gramps” McNeel. 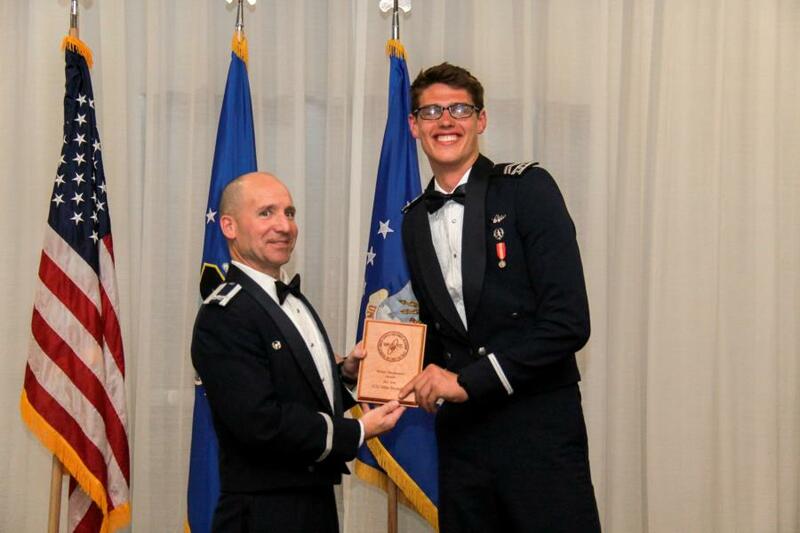 This award is given to the First-Class Cadet Soaring Instructor who has demonstrated a strong desire to motivate individuals not only in basic flying, but extracurricular flying experiences as well. The Nominees are: C1C Merrick Isley, C1C Tyler Dockum, and C1C Ryan Lee. The Winner of the 2017 Larry McNeel award is: C1C Tyler Dockum. The next award is the Capt Curtis B. Lott (i - ought) Award, awarded in memory of a former soaring Instructor pilot who lost his life in a T-38 accident at Holloman AFB on 18 April 1989. 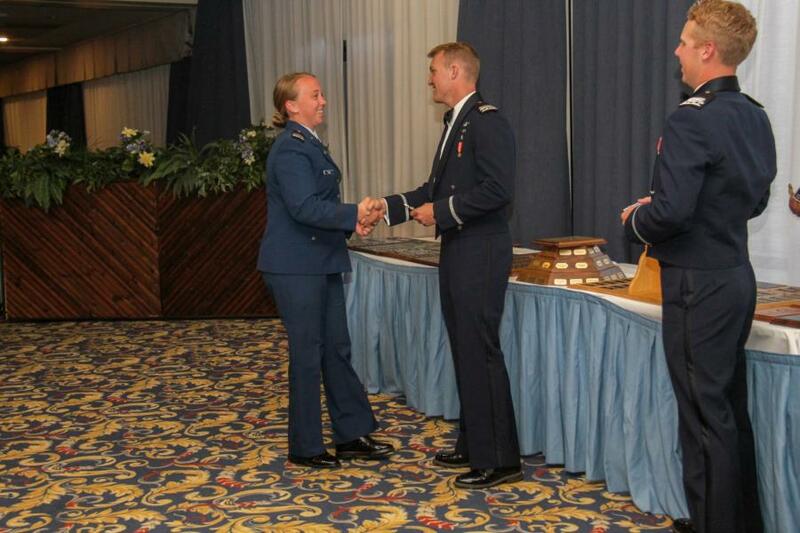 This award is presented annually to the First-Class Cadet Soaring Instructor who excels in all aspects of instructing cadets. Presenting this award is Vice Superintendent Col Harris. The Nominees are: C1C Tristan Walton, C1C Kaitlyn Brown, and C1C Matt Correa. The Winner of the 2017 Curtis Lott (i-ought) Award is: C1C Tristan Walton. Next, we have the Weber-Stephenson Award, which is awarded annually to the outstanding Second-Class Cadet Soaring Instructor Who displays an intense love of flying, a strong desire to share and teach flying to others, and demonstrated leadership ability. 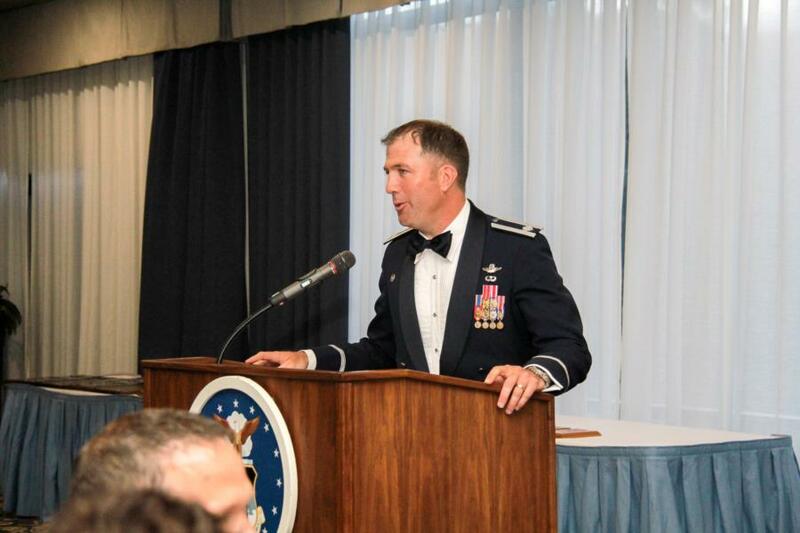 presenting this award is Col Dale Hetke, Commander, 306th Flying Training Group. The Nominees are: C1C Mitch McCulley, C2C Milo Browder, and C2C Stephen Carter. The Winner of the 2017 Weber-Stephenson Award is: C2C Milo Browder. 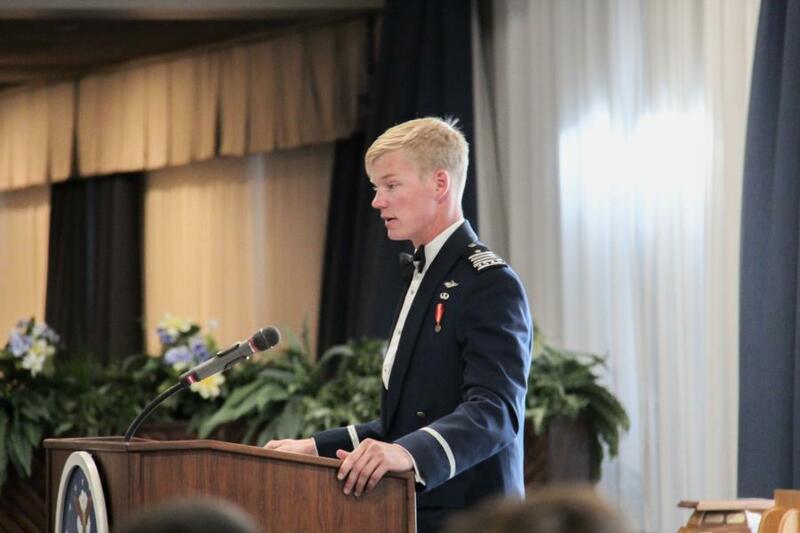 The 2nd Lt Peter Sohm Award is presented annually in member of 2nd Lt Peter A. Sohm, USAFA Class of 2010, who died in an airplane accident on 17 April 2011. Lt Sohm was a member of the 94th FTS during his tenure as a Cadet. 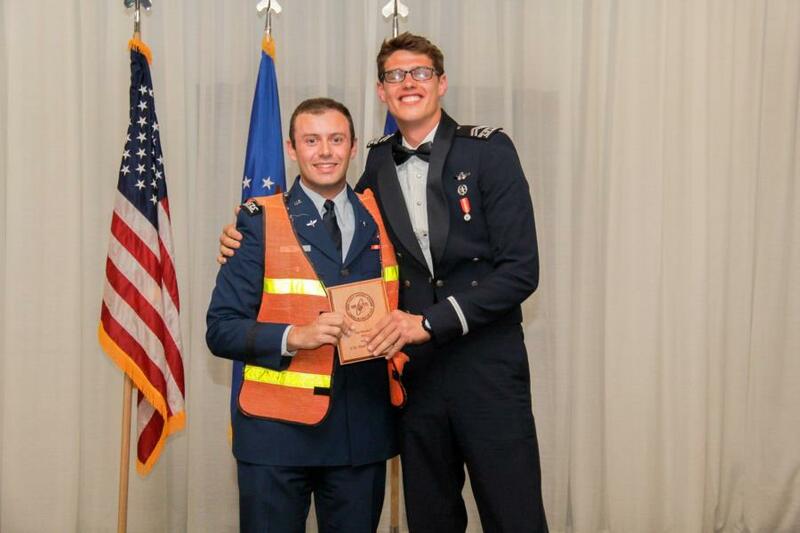 This award is given to the Second-Class Cadet Soaring Instructor Pilot who has demonstrated a strong desire to motivate individuals into flying. 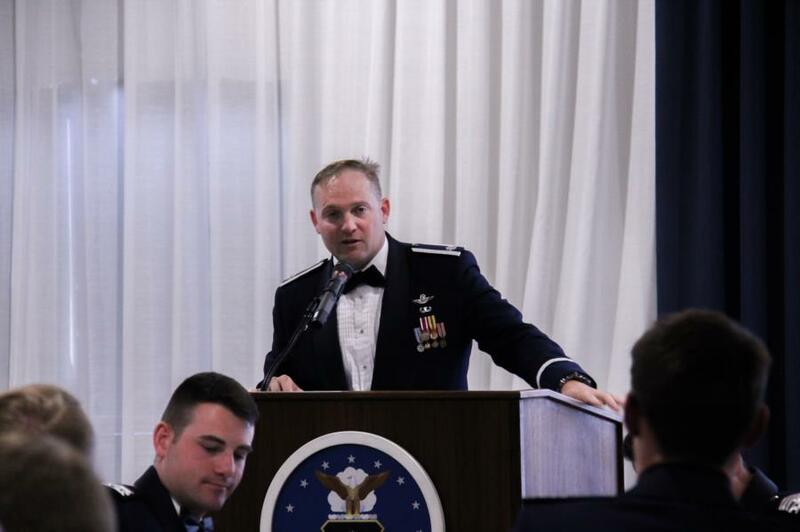 The 94th FTS were privileged to have the father of Lt Sohm, Mr. Evan Sohm, presenting the award. The Nominees are: C2C Ben Jakeman, C2C Stephen Carter, and C2C Austin Good. The Winner of the 2017 Peter Sohm Award is: C2C Ben Jakeman. Sadly C2C Ben Jakeman could not attend the event. 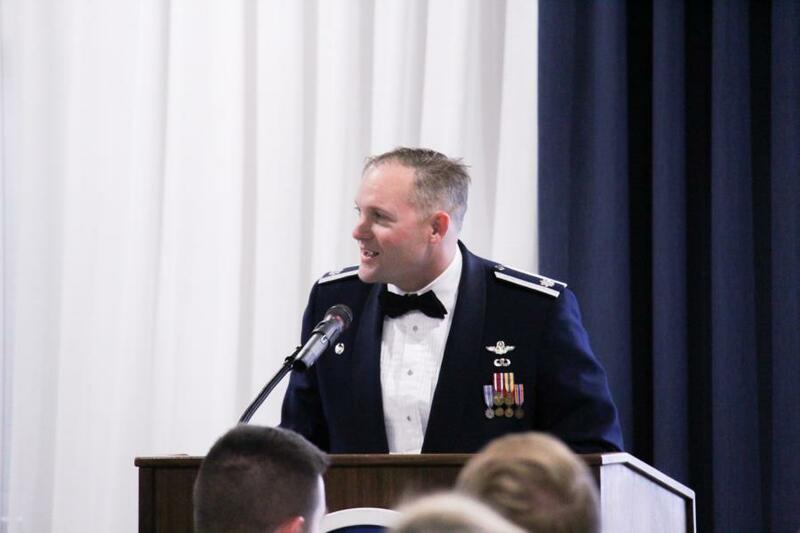 The Lt Col Riddlebarger Award is presented annually in memory of Lt Col Jeff “Cheese” Riddlebarger, USAFA Class of 1988, who died after a short battle with a rare stomach cancer. Cheese was a member of the 94th and 70th Flying Training Squadrons and an active participant in the Advanced Soaring Programs at the time of his death. 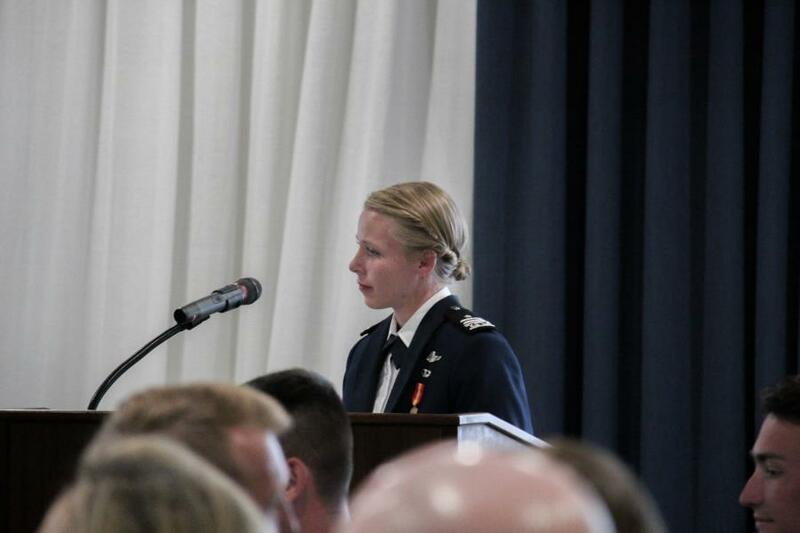 This award is presented to the Advanced Soaring Cadet who best exemplifies humility, approachability, and credibility along with flying excellence. 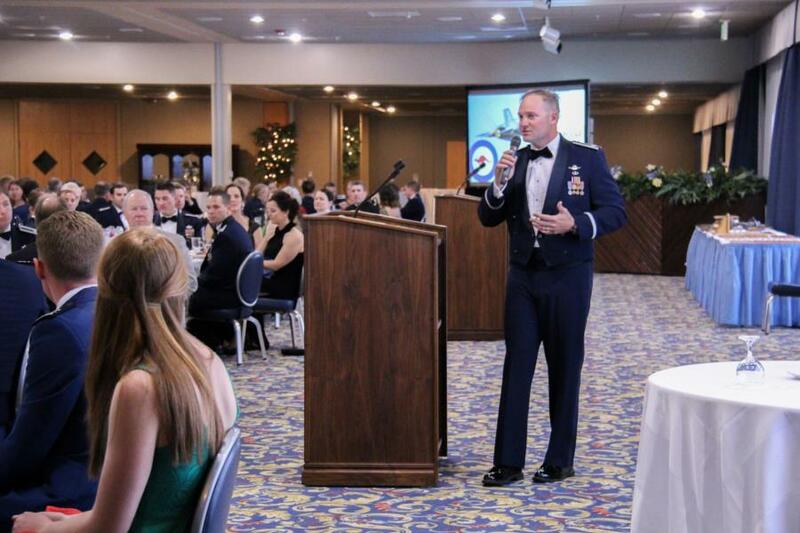 Presenting this award is Lt Col Matt Humphrey, Director of Operations, 94th Flying Training Squadron. The Nominees are: C1C Matt Correa, C1C Kaitlyn Brown, and C1C Merrick Isley. The Winner of the Lt Col Riddlebarger Award is: C1C Matt Correa. This next award is in remembrance of the World War II Glider Pilots, who faced innumerable obstacles and challenges and overcame them by implementing innovative techniques and taking the risks necessary to complete their missions. 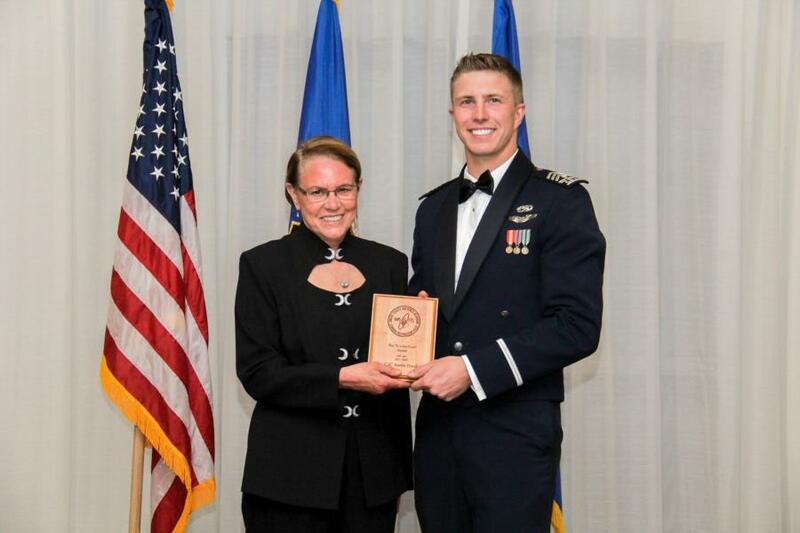 The First-Class or Second-Class Cadet Soaring Instructor who has applied innovation to trials in order to ensure the success of the 94th Flying Training Squadron shall be presented with this award. Presenting this award is the National Wing Commander for the WWII Glider Pilot Association, Ms. Patricia Overman. The Nominees are: C2C Austin Good, C2C Mitch McCulley, and C2C Stephen Carter. The Winner of the “G” is for Guts Award is: C2C Austin Good. 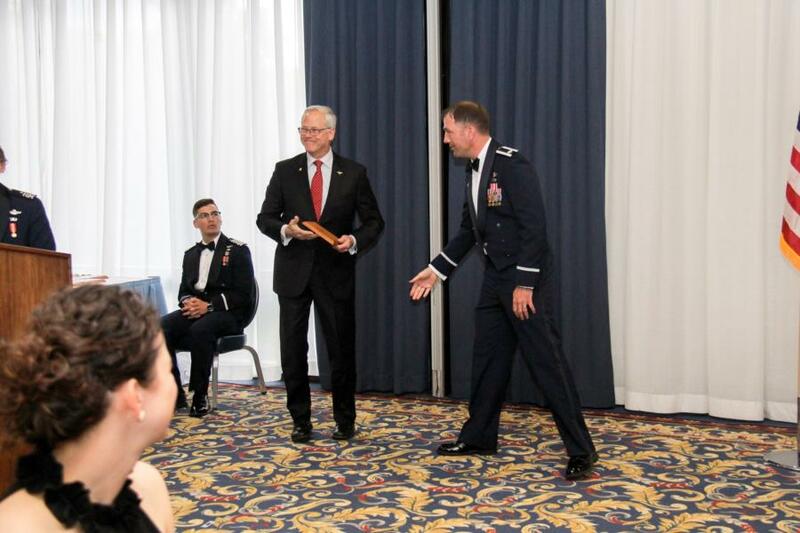 Finally we have the Top Flight Commander Award which is presented annually to the top Cadet Flight Commanders for the Airmanship 250, 251, and 461 programs. Nominees for these awards have demonstrated superior leadership and an unwavering commitment to their squadron, respective programs and subordinates throughout their tenures. 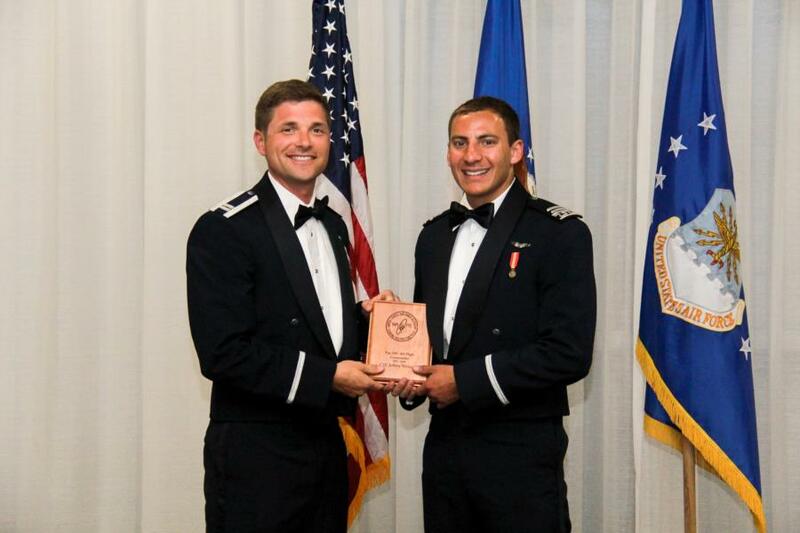 Presenting the award for AM-250, Instruction to Soaring, is Capt Marcus Rosenthal. The Nominees are: C1C Dave Koonz, C2C Milo Browder, and C1C Emily Shunk. 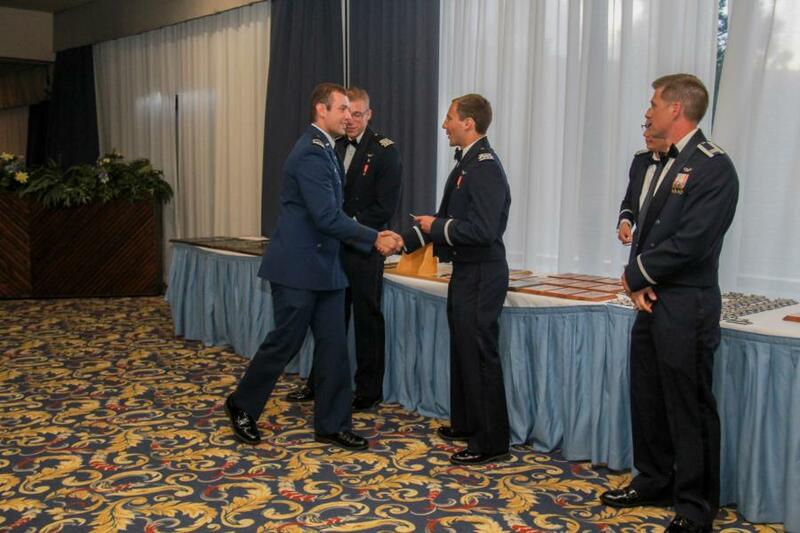 The Winner of the Top AM-250 Flight Commander Award is: C1C Dave Koonz. Sadly, C1C Koonz could not be at the event. 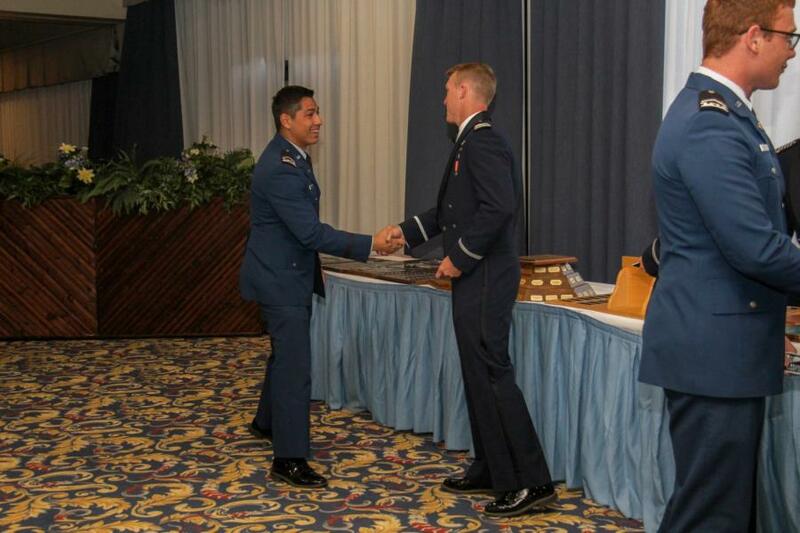 Presenting the award for AM-251, Basic Soaring, is Capt John Saydah. The Nominees are: C1C Matt Correa, C1C Mauricio Agudelo, and C1C Bram Gygax. 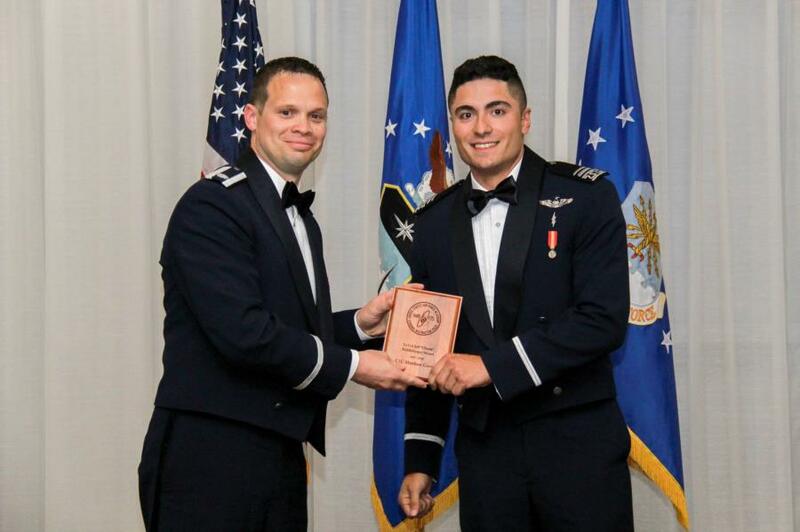 The Winner of the Top AM-251 Flight Commander Award is: C1C Mauricio Agudelo. Sadly, C1C Agudelo could not be at the event. 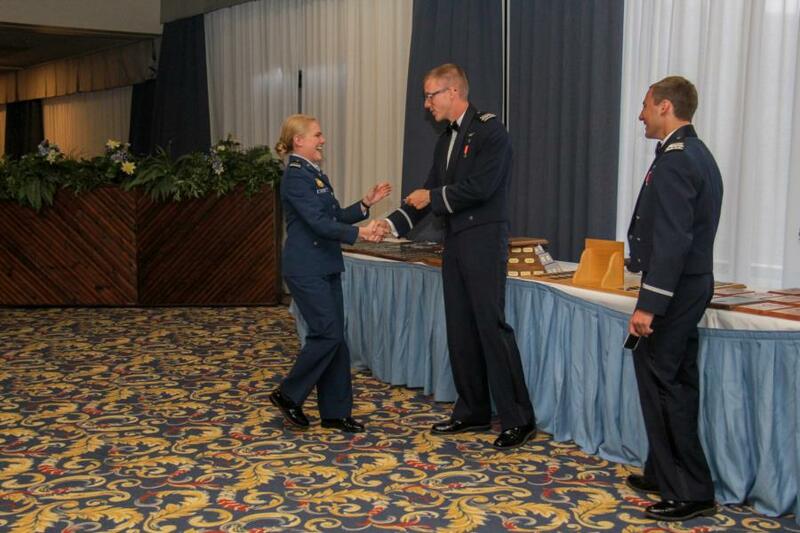 Presenting the award for AM-461, Cadet Instructor Pilot Upgrade, is Capt Karol Bohn. The Nominees are: C1C Jeff Weingast, C1C Tristan Walton, C1C Joshua Roseler, and C1C Evan Loughlin. 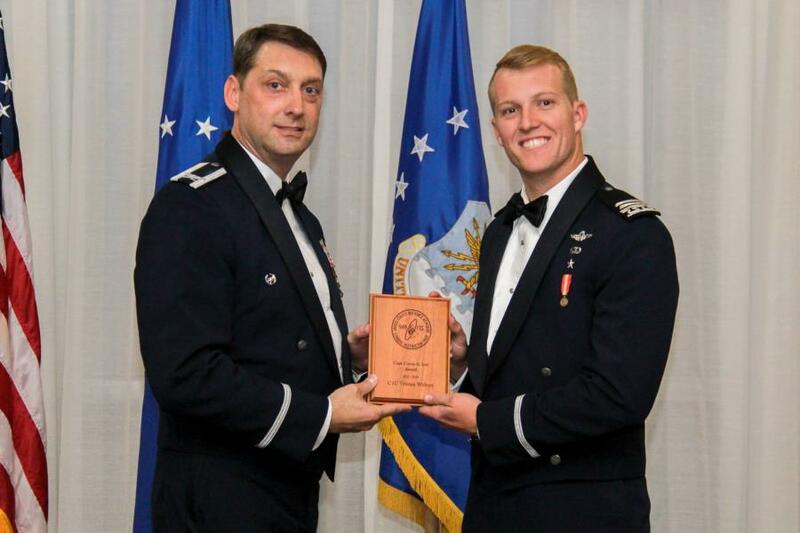 The Winner of the Top AM-461 Flight Commander Award is: C1C Jeff Weingast. 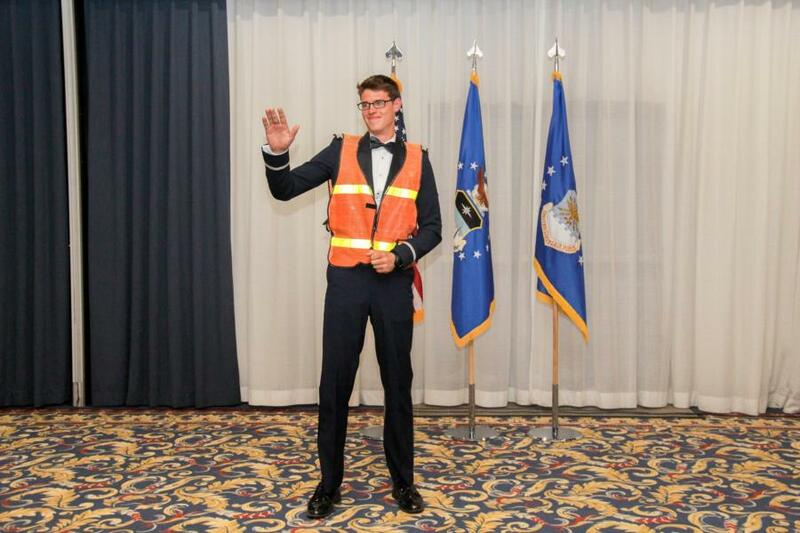 The next part of the evenings ceremony was the presentation of Glider Wings, also known as “G-Wings,” to the Class of 2020 upgrade Instructor Pilots. G Wings represent the culmination of a year’s worth of blood, sweat, and tears both on and off the flight line. Each upgrade Instructor Pilot spent over 300 hours down at the airfield completing more than 80 glider sorties, 30 hours of classroom instruction, countless general knowledge sessions, and a rigorous syllabus. All while fulfilling his or her academic, military and athletic commitments as members of the Cadet Wing. "The G-Wings symbolizes the qualifications as the Air Force’s youngest Instructor Pilots. According to the Army Air Corps Guide, the Glider Pilot rating was awarded for the successful completion of a prescribed advanced course of glider pilot training at an Army Air Corps special service school. The emphasis of the early glider program was to produce a basic-skilled glider pilot who would insert troops and equipment into a combat zone. 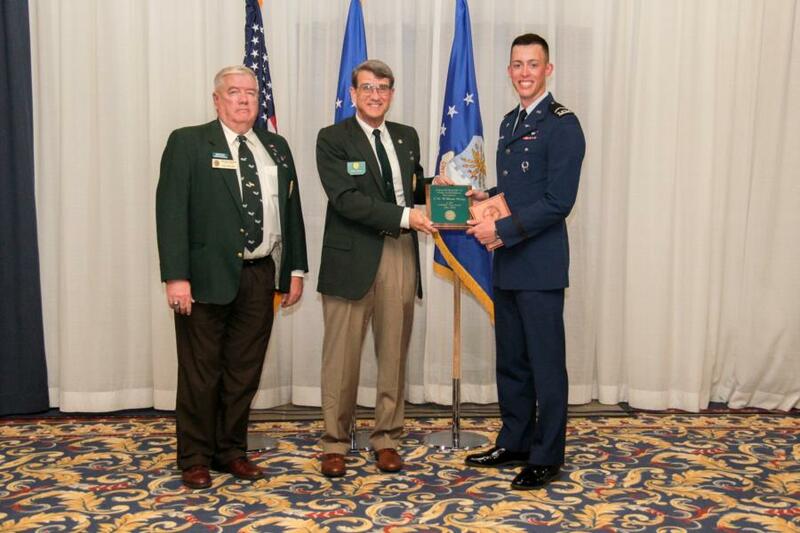 The Army Air Corps program graduated a glider pilot with a planned 10 to 15 hours of training. Today, the Air Force Academy’s program qualifies young Cadet Glider Instructors in approximately 25 hours of flying training. Surprisingly, much of the Army Air Corps glider pilot ground training is very similar to the current Cadet soaring upgrade experience. However, despite any comparisons we might make, we stand proudly here today acknowledging one commonality; the men and women of the past and of today have all stepped up to the challenge of learning to fly in an un-powered aircraft where “Go around” is not the vocabulary. 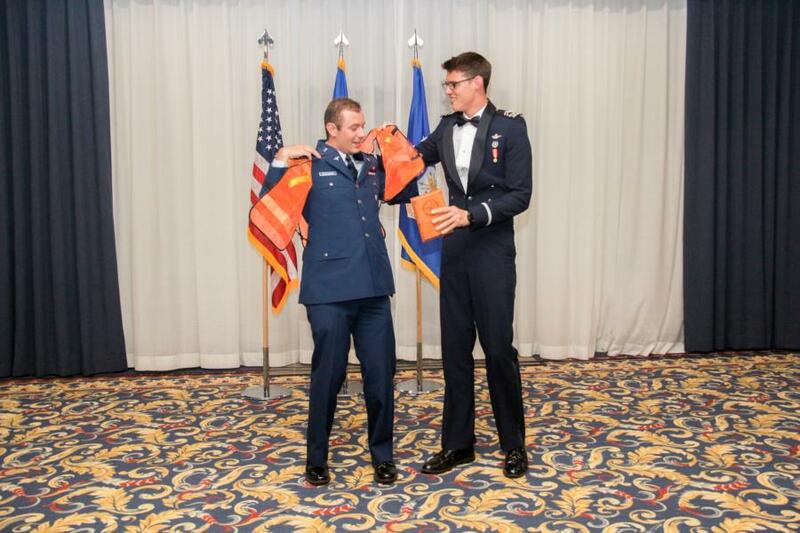 Cadet Roseler and Cadet Weingast, the M-Day Flight Commander’s and Cadet Walton and Cadet Loughlin, the T-Day Commander’s for the 17-18 Academic Year presented each of their groups of upgraders with their G Wings." Additionally, they recognized those upgrade Cadets who are currently training in Texas this week and couldn’t be at the event. After the G Wings were distributed it was time to recognize the outstanding performers of the Class of 2020. The first award is the Distinguished Graduate Award. This award is given to the upgrade Cadets who finish in the top 10% of their class. Lt Col Lushnat, the 94th Commander and Lt Col Humphrey, Director of Operations, presented the awards to the the DG’s. C3C William Wing, C3C Tristan Berringer, C3C Dan Carpenter, C3C James Van Der Linden, C3C Michael Higgins, C3C Brynn Lunaas, C3C Danial Veideman, and C3C Michael Cloninger. The next award is the Daedalian’s Top Stick Award. It is presented annually to the upgrade Cadet who graduated at the top of his or her class. Presenting this award and representing the Daedalian’s is Brig Gen (Ret) Mark Wells. The Nominees are: C3C William Wing, C3C Dan Carpenter, and C3C Brynn Lunaas. The Winner of the 2018 Top Stick Award is: C2C William Wing. The next award is the Hard Charger Award. 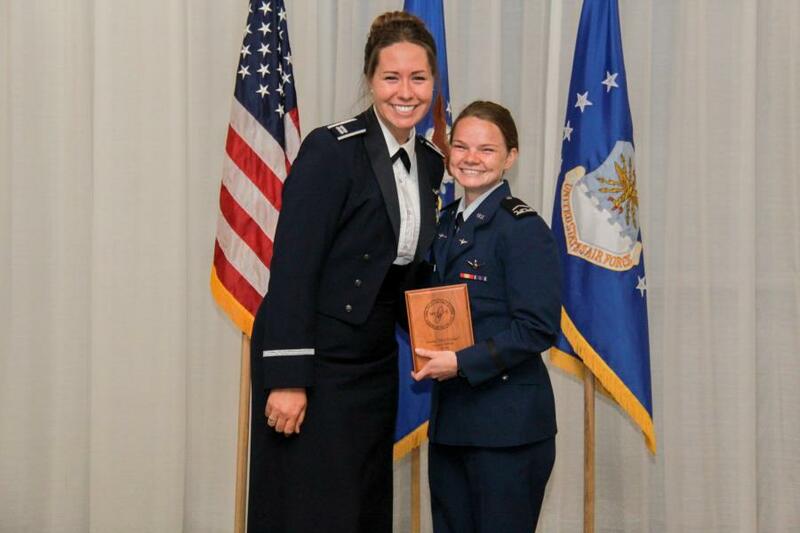 This award recognizes an M-Day and T-Day upgrade Cadet, as voted on by their respective peers, as the hardest working student with the best attitudes throughout the year. 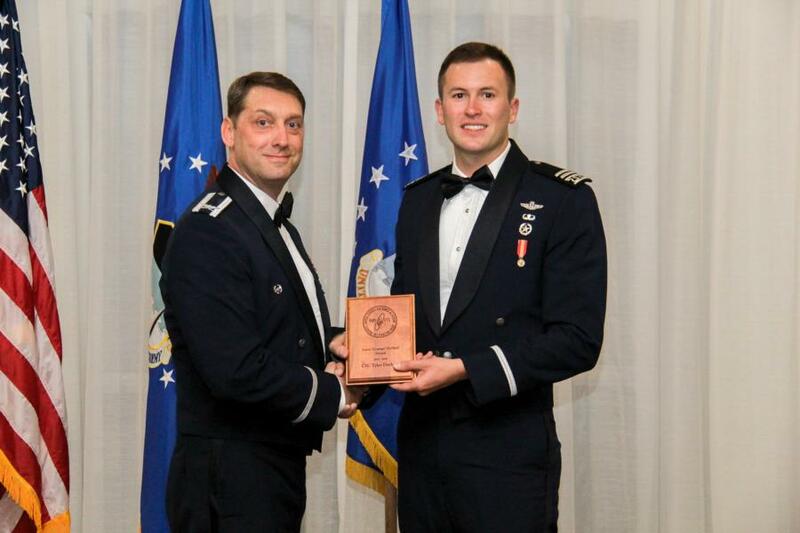 Presenting this award was Capt Wise, the Assistant Flight Commander for AM-461. The Finalists for M-Day are: C3C Julia Pack, C2C Regan Hefner, and C3C Paul Dudunakis. The Winner of the 2018 Hard Charger Award for M-Day is: C3C Julia Pack. The Finalists for T-Day are: C3C Dan Veidenman, C3C Kyle Gericke, and C3C Braydon Huskchka. The Winner of the 2018 Hard Charger Award for T-Day is: C3C Kyle Gericke. This next award of the evening was the Top Marshaller Award. 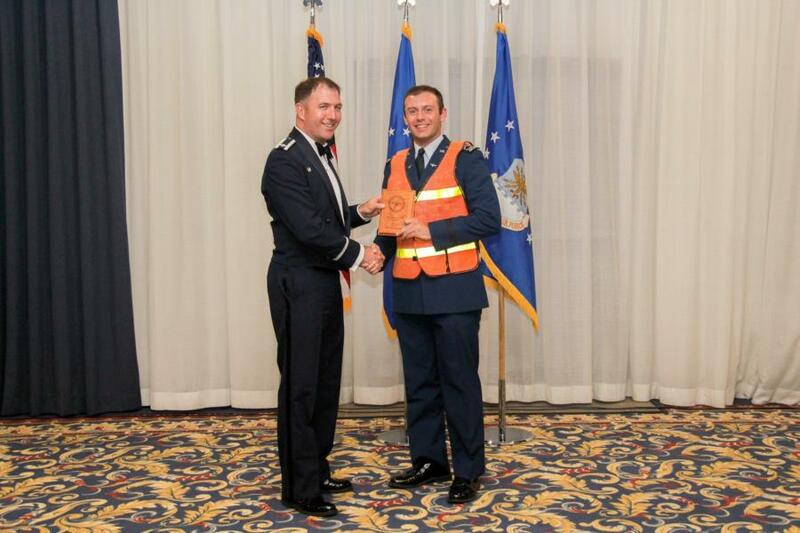 This award is given to the upgrade Cadet, as voted on by their respective peers, for the most efficient and effective command and control of flight line throughout the year. Presenting the award is last year’s winner, C2C Milo Browder. The Finalists for Top Marshaller are: C3C Joseph Belina, C3C Monte Koerner, and C3C Paul Dudunakis. The Winner of the 2018 Top Marshaller Award is: C3C Paul Dudunakis. The second to last award for the Class of 2020 is the Spirit of the 94th Award. 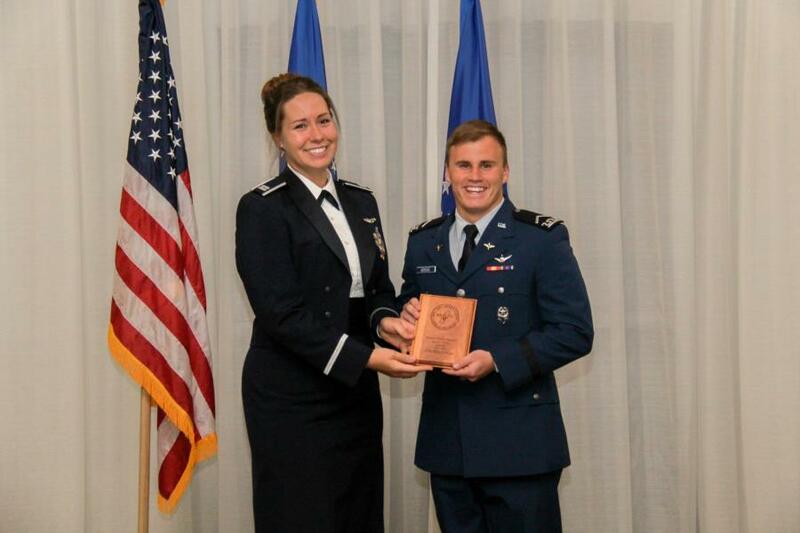 This award is presented to the upgrade Cadet, as voted on by the Officers and Cadet Leadership, who best exemplifies the spirit of the 94th Flying Training Squadron. Criteria include, but are not limited to: humility, approachability, credibility, airmanship, leadership, and professionalism. Presenting this Award is Lt Col Lushnat. The Finalists for the Spirit of the 94th Award are: C3C Paul Dudunakis, C3C Dean Bartschi, and C3C Dan Veideman. The Winner of the 2018 Spirit of the 94th Award is: C3C Paul Dudunakis. The last award of the evening is the The Top Overall Airmanship Award for the Class of 2018. The Nominees are: C1C Kaitlyn Brown, C1C Max Marasko, and C1C Tristan Walton. The Winner of the Top Overall Airmanship Award for the Class of 2018 is: Wouldn’t you like to know! (This award is given during the final days of graduation week to the winner. Congratulations to whomever the award goes to! Closing remarks were provided by Lt Col Lushnat. Congratulations to all of the Class of 2020 Cadets for completing the AM-461 Upgrade program and to all of the award winners! To view the rest of the pictures from our glimpse into the G-Wing and Awards Ceremony go to; Classes - 2018 - Graduation Week. Or click the link below.